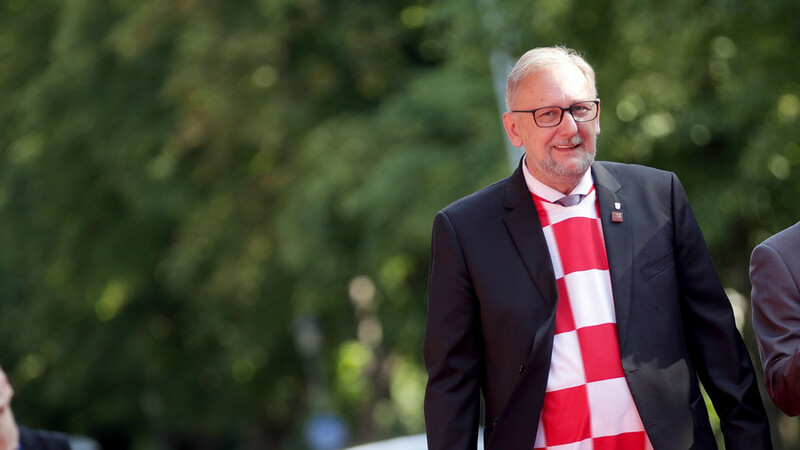 Croatia's interior minister Davor Bozinovic has become the latest politician to abandon dress protocol for fandom, when he wore the national team shirt to an EU meeting the day after his team won a place in the World Cup final. The 56-year-old could be seen liaising with other ministers in the conspicuous outfit, who received the gesture with smiles and even gave messages of support, as Croatia became the smallest-ever European country to reach the stage. Bozinovic is not the first to show his ardent patriotism through his support for the football team; President Kolinda Grabar-Kitarovic wore a Croatia shirt while in the VIP box supporting her country in their quarterfinal win over hosts Russia in Sochi on Sunday. More recently, the president predicted that Croatia would win the World Cup during the NATO summit, where she shared a dinner table with French president Emmanuel Macron. Croatia beat England 2-1 with an extra time goal from Mario Mandzukic at Luzhniki Stadium on Wednesday. They now go on to play France in the final in the same stadium this moving Sunday.